In December 2012, General Motors sold 2,633 copies of the Chevrolet Volt – accounting for an improvement of 72% over the same month last year while also bringing about a significant improvement from the slow Volt sales in November (where just 1,519 units were sold). That makes December 2012 the 4th best month for the Chevy Volt in terms of sales since being introduced just over two years ago with the top three best months all coming in 2012 (October, September, August). 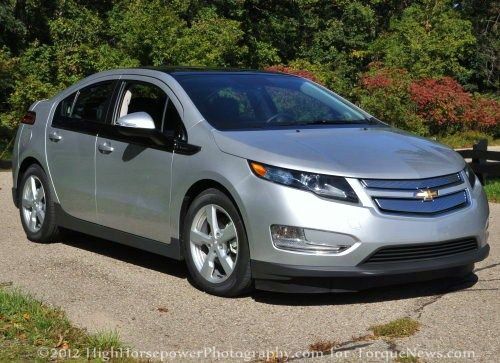 The Volt’s best month of all time came in 2012 with September seeing 2,961 units sold. The Nissan Leaf moved just 1,489 units last month and while that was the Japanese electric vehicle’s third best month of the 2012 calendar year (following October, November) – it still caused the all electric Leaf to fall well short of the Chevy Volt in the December 2012 sales race. The good news for Nissan was that December brought about a 56.1% increase over the same month last year and in a year where the majority of the months saw well under 1,000 units sold, the Leaf finished strong in the last three months of the year. The Leaf’s best month ever came in June of 2011 when the company delivered 1,709 EVs. December gave GM their 10th monthly segment sales win of the year but the most important figure of all was that with 23,461 Chevrolet Volts sold in 2012 – the electric Chevy was the bestselling car in the electric vehicle segment. This accounts for a growth rate of 205.8% in 2012 over 2011 when just 7,671 Volts were sold. The Nissan Leaf delivered just 9,819 units during 2012 and while that accounted for an improvement of 1.5% compared to 2011, the all electric Leaf has seemingly lost a great deal of its initial momentum while the Chevy Volt has continued to post strong numbers. Technically, General Motors won the EV sales battle in 2010 (although both vehicles were only available for about a month in December) with 326 Chevrolet Volt sedans sold compared to just 19 Nissan Leaf EVs. Nissan struck back in 2011, with the Leaf beating the Volt by a margin of 9,674 to 7,671 but with Chevrolet’s landslide win in 2012 – GM has now offered the bestselling EV in the US two out of the last three years. The good news for Nissan is that with 19 vehicles delivered in 2010, 9,674 delivered in 2011 and the 9,819 units delivered in 2012, the company has delivered 19,512 examples of the Leaf in the US so they should pretty much be finished fulfilling the initial 20,000 American Leaf orders. The even better news for those hoping to buy a new Nissan Leaf is that the company plans to launch production in the US so the electric Leaf should soon be more readily available. 2013 will be a big year for both the Chevrolet Volt and the Nissan Leaf due to a wide variety of new electric and plug-in hybrid vehicles that are likely to cut into the market share of both the Volt and Leaf…although the new entrants to the segment should have more of an impact on the Nissan than the Chevrolet. Vehicles like the Ford Focus Electric, the Chevrolet Spark EV and the Fiat 500E will take direct aim at the Nissan Leaf and while there are new plug-in hybrids such as the Ford Fusion and the Ford C-Max that will offer incredible all electric range with endless gas-powered mileage, none of them are able to offer the full range of all electric acceleration of the Volt nor can any of them offer the electric and overall range. Your article might make sense if the Volt was electric... idiots.